Then she made...: Love is in the Details! I've heard it said multiple times that Love is in the Details. I hope it's true because today is Valentine's Day and I've tried to put love in the details of what is normally just an ordinary Tuesday. We don't really have big family traditions on this day of love however, we do always try and celebrate it in small ways. Like for example; I will wear perfume today - whoa! I know, that's a huge thing right? No. Not really. But when your everyday wardrobe consist of a baseball hat, jeans, a hoodie and slippers, well, perfume really isn't the priority. Today it will be. My husband will like the small detail of a nice smelling wife even if it's only one day a year - hahaha! Seriously though, here are some LOVE-ly details that have been occupying my Valentines Day and hopefully filling my children's hearts with joy and happiness and their brains with the knowledge that their mom does, indeed, love them greatly! 1- School Valentines: These started yesterday when I went to the store to buy the supplies. Seems I wasn't the only one who procrastinated because the lines were long and the people were grumpy. However, the store was on top of it's game and had plenty of Valentines supplies to meet every shopper's need. 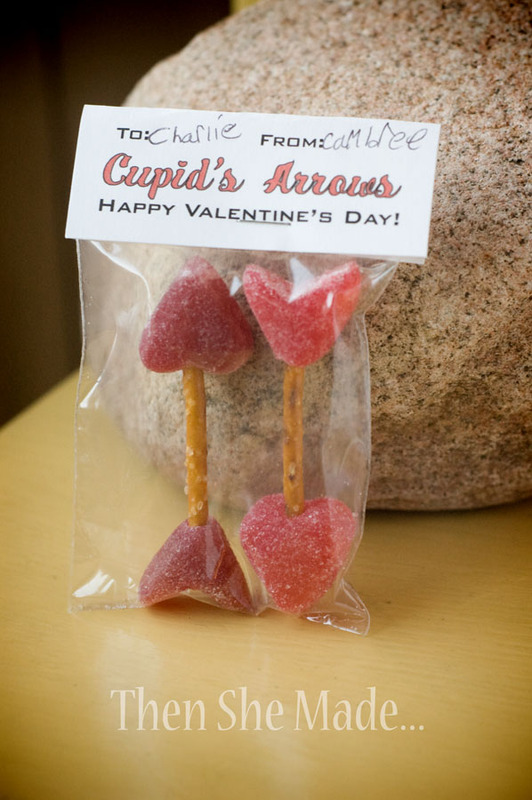 I purchased gummy hearts and pretzel sticks and then spent several hours making 128 of these little arrows. Yep, 128! When you have twins you get to do everything in large numbers. I'm not going to lie, cutting those sticky little things was a pain but love is in the details, right?! My little Jet was the one who asked for these. She found them on Family Fun and at the time I was thrilled to have a creative break. I didn't have to come up with anything clever or think of anything new as the work had already been done for me. All I had to do was the manual labor. 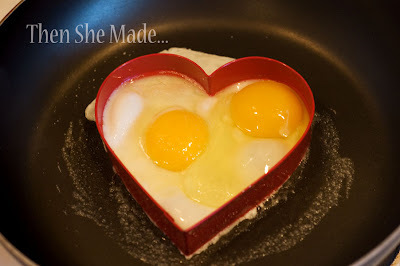 2- Heart Shaped Food: Did you ever think you'd visit my blog and see raw eggs? Nope, me either. I guess there's a first for everything. This morning I made my twins fried eggs. They love fried eggs for breakfast but I don't make them regularly. However, love is in the details so they not only got fried eggs but they got them in the shape of a heart. Awww! I thought it was a good idea however I handed the plate to my little Jet and she dug right in. There was no comment on the shape so I asked, "Do you know what that is?" She replied, and quite sarcastically too, "It's a fried egg!" She didn't verbally add the "DUH!" but I swear I heard it. I had to point out that it was in the shape of the heart and then we hugged and fully enjoyed this great mother-daughter bonding moment. Actually, that part isn't true. She just kept eating. FYI: Did you know you can use your metal cookie cutter shapes to cook all kinds of things? Try it. My two favorite things to use them on are eggs and pancakes. Just make sure you spray them with non-stick cooking spray first otherwise you'll have an epic fail. Trust me on that one. 3- More Heart Shaped Food: I packed PB&J for lunch today and of course used a heart shape cookie cutter to cut it into the shape of heart. The twins probably won't notice it's in the shape of a heart. Instead they will just be thrilled that the crust has been removed. I never remove the crust. I also used a tiny heart shape cookie cutter to cut cheese. 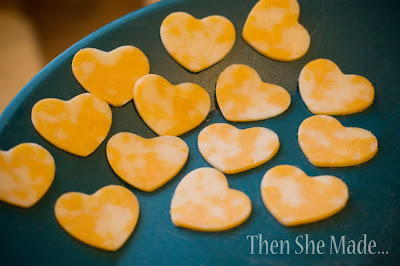 Now these cheese hearts are cute and I'm guessing the girls will notice and fully enjoy them and their shape. Besides, the cheese is really, really good. It's a new blend, Cheddar-Mozzarella and it's delish! This little detail of love will be a hit! 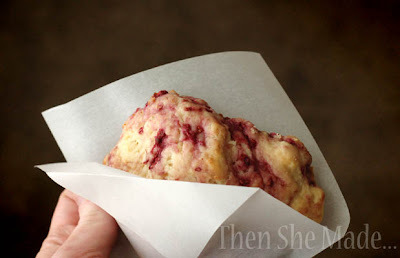 4- White Chocolate Raspberry Scones: My Miss M, she's 14, asked me last week if she could take a treat to her seminary class on Valentine's Day. Seminary is a religion class that she goes to every day before school. She wanted scones. No problem except these are best fresh out of the oven and her seminary class is at 6:00 A.M. But love is in the details so when I woke up at 3:45 A.M. and I just did my best to channel the Happy Homemaker mom that is buried way down in my little toe and I baked away. She was happy and so were her seminary friends. She also asked for treats for her biology class. Happy Homemaker mom was long gone by then so she got store bought cupcakes - it's all good, right?! 5- Heart Attack: Next we are off to buy hearts at the dollar store to decorate their rooms. Sorry no picture on this one yet. Hubby is helping and we are going to give them a "heart attack". It will be fun and then after that I'm all detailed out and will gladly climb into bed for a long nap. Dinner will most likely be mac and cheese from the magical blue box but I'm not worried. When I dish it up I'll serve it on a plate instead of a bowl and I'll arrange those orange noodles into the shape of a heart and call it good. Hmmm, maybe some red food coloring will make it extra special - aaah, yes, just another detail! Those are the cutest treats. You are so creative. Love all the heart themed food. We are still making your amazing chocolate roses--for my girls friends, for teachers and for visiting church friends. Thanks for the great idea--we've gotten a lot of milage from it. Wooden skewers are inexpensive and a great length. Also we like to add leaves from fake flowers. By the way Miss N. says HI to Miss M.